It’s that time of the year! The leaves change colors, the air becomes crisp and cool, and October brings everyone’s favorite holiday. Halloween is a perfect excuse to make crafts to decorate your home. If you are keen on having decorations for every season, then fall crafts are a great way to go! There are plenty of easy fall crafts for you to make. The best part is that the crafts are made of recycled materials! What could be better than helping the environment and decorating your house for fall? What Materials Do You Use for These Recyclable Autumn Crafts? All these materials are easy to find and collect. Also, make sure to clean bottles and cans well so that they don’t smell down the line. When you think of fall, you think of colorful leaves and crisp, afternoon air. It’s the season of pumpkins and fattening holidays. There are many fall crafts for adults to make out of recyclable materials. Form wreaths to garlands, there are tons of fall decorating ideas. A wreath is a trademark decoration of fall. Typically, wreaths have leaves and acorns scattered about. 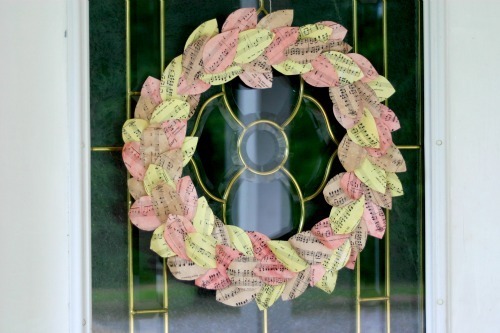 This fall wreath is unique because it is made out of recycled paper instead of leaves. First, you need to grab any kind of paper you have lying around. It can be junk mail, magazine pages, or newspaper. You will also need scissors, a pencil, dye, a hot glue gun, and a wire hanger. To begin, dye your paper whatever color you would like. Some people use two to three colors to make their wreath colorful! Once the dye dries, you should fold the paper and draw a leaf, or leaves, onto it. Cut out the leaf, or leaves, because these will make up your wreath. Next, fold the wire hanger into a circle and hot glue the leaves onto the hanger. Lastly, fill in the empty spots and, voila, a wreath! If you’re a big coffee drinker, then you might have some coffee filters lying around! Luckily, there is an easy craft you can make with coffee filters. This is definitely one of the more unique fall crafts for adults to make. First, you will need coffee filters, fall colored markers and watercolor paint, a paintbrush, scissors, a hole punch, and string. You will need to tear the coffee filters into medium-sized pieces. Next, draw a leaf on each piece of torn coffee filter. You can either color or paint the leaves. Once you have about 10 to 15 painted leaves, then let them dry. After the leaves have dried, cut out the leaves and punch a hole at the top. Lastly, lace the leaves on a string. Tie a knot between each leaf so they don’t fall off or scrunch together. Congratulation, you’re done, you have a leaf garland! The spookiest holiday of the year is Halloween. People dress up in crazy costumes and eat buckets full of candy! Halloween is also the best holiday to decorate your home. There are ghouls, goblins, ghosts, and witches that can stand outside your house. The high quality decorations are expensive and might not last long enough to justify spending money on. Have no fear, though, because there are plenty of DIY fall décor ideas that are sure to scare the neighbors! Mason jars are popular these days and can be used for almost anything. You can use them as cups, vases, piggy banks, and to craft. To begin, you will need mason jars, black and orange tissue paper, glue or modge podge, scissors, a paint brush, and paper plates. Once you have your materials, start by cutting pieces of orange tissue paper into squares. Next, use the glue or modge podge to place the pieces of tissue paper on the outside of the jar. Do this until the jar is orange all the way around and let it dry. Next, cut three triangles and jack-o-lanterns teeth out of the black tissue paper. Lastly, glue the black tissue paper onto the jar and let it dry. Once the jar is dry, you can put a candle into it to make the lack-o-lantern glow. Candy corn tastes great to some people and terrible to others. It’s hard to agree whether the candy is good or not. 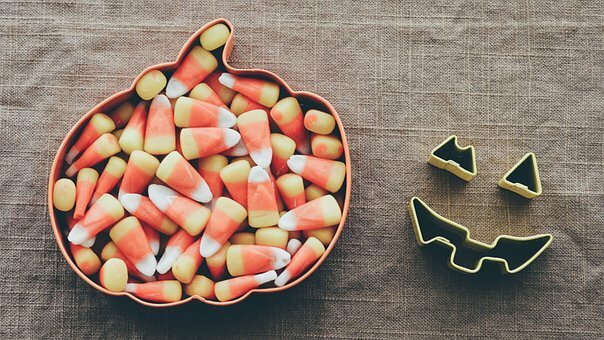 Luckily, making candy corn out of glass bottles is easier than settling this debate! What you will need is a glass bottle, yellow, orange, and white paint (acrylic or spray), and a paintbrush. First, you should paint the bottle white and let it dry. This will help the colors to fade into one another. Next, paint the middle of the bottle orange and let it dry. Lastly, you should paint the bottom third of the bottle yellow and let it dry. You can add a bow or string to finish the craft! This next craft is great for lighting up the pathway up to your door! You will need a mason jar, gauze tape, flour, water, black construction paper, and glue. First, cut the gauze into strips to go around your jar. Next, mix flour and water together until it has a light gravy-like consistency. This will act as a glue to hold your gauze strips onto the jar. Next, soak the gauze strips in the mixture. Run your finger over the strip of gauze to remove any excess mixture before placing it on the jar. Place the gauze irregularly and completely onto the jar and let it dry overnight. Once it’s dry, you can cut out facial features for the mummy using the black construction paper. Glue the pieces of paper onto the jar using regular glue. Now, you have a spooky mummy to greet trick-or-treaters on Halloween! If kids love anything, it’s to get dirty and make something unique! There are plenty of easy crafts that kids can do that will brighten up your home. A very simple craft that kids enjoy is to trace leaves. You will need a leaf, construction paper, crayons, and a hard surface. First, you can set out on an adventure to find the best leaf in the yard! Then, you place the leaf on a hard surface. Place a piece of construction paper over the leaf and, lightly, run the crayon over the paper. This should make a tracing of the veins of the leaf you found. Tracing leaves is a great way to get your kids outside and to make art suitable for the fridge. Children love to play pretend with dolls and action figures. For this craft, you will need leaves, sticks, markers, and glue. Again, you can set out on an adventure to find the longest sticks and crunchiest leaves in the park! Then, you make a figure out of the sticks and leaves. Ideally, the leaf would be the head and clothes. The sticks can be the arms, body, and legs of the leaf person! Once your child is satisfied with their person, you can glue the sticks and leaves together. This is a great craft that the children can play with once the glue has dried! Fall is a perfect time to decorate your home. There are two fattening holidays that are easy to decorate for. You can make a turkey for Thanksgiving or a pumpkin for Halloween. It’s easy to make these decorations and barely costs any money. All of these crafts are made out of recyclable materials and don’t take long to create. From fall themed decorations to Halloween themed decorations, there’s a fall craft for everyone. There are even crafts that are easy for kids to do. Not only are you creating a beautiful home for the holiday, but you’re also creating a cleaner planet by using recycled materials!